This has been an amazing September weekend. Oh, what’s that you say? It’s November? That makes it even more amazing. It is 70F/21C as I type this on a late Sunday afternoon. We still have not had a temperature at or below freezing and one is not in the forecast for the coming week. The latest freeze date in recorded Minnesota history happened on November 8, 1900. We are set to smash the record. We are also set to have the longest growing season on record. Anomaly? It is hard to believe it since October marked the 15th consecutive month of above average temperatures here in Minnesota. I am beginning to suspect we don’t know what normal or average is any longer. In the garden the fava beans are still going strong. I have mums still blooming and calendula flowers blooming and putting on new buds and marigolds too. Some of the asters were still blooming until earlier in the week but they have all bloomed out now and are beginning to go dormant. I have carrot seeds that I planted in the spring that didn’t sprout that are sprouting now. Added to that, it has been a bad week for allergies. Usually by this time everything is frozen and I can put my allergy medication away until spring. Whatever is in the air right now has me sneezing, my skin creepy-crawly, and my eyes itchy and burning. Until this past week I had really been enjoying the extended warm autumn but with this latest allergy attack I want it to freeze already and be done. My immune system is tired and needs a break. The Dashwoods have no idea what winter is. They live their happy, simple lives and take things as they come. 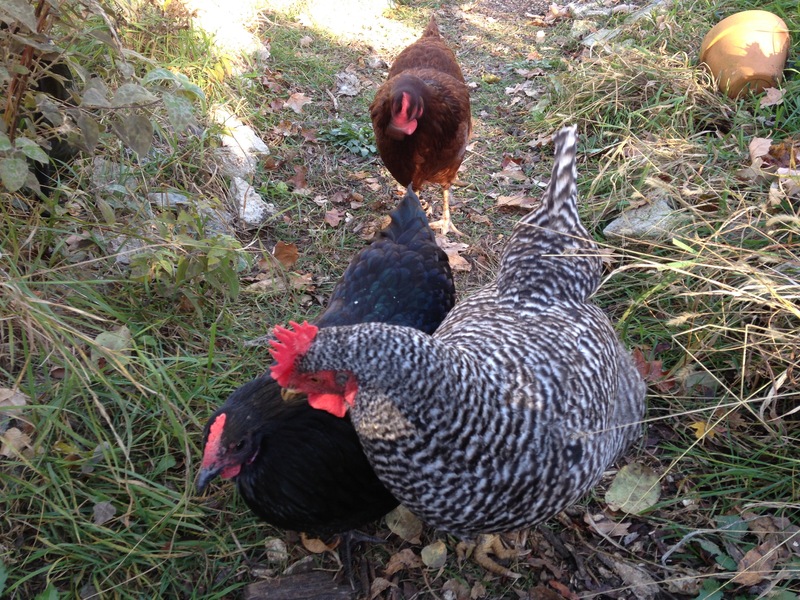 They get excited to be let out of the run and into the garden or when they get a treat, they like gathering around my feet and talking to me, and now all of them push their way in front of me when I am kneeling in the garden pulling out weeds and dead plants. Bookman was having a good laugh at their helpfulness today. 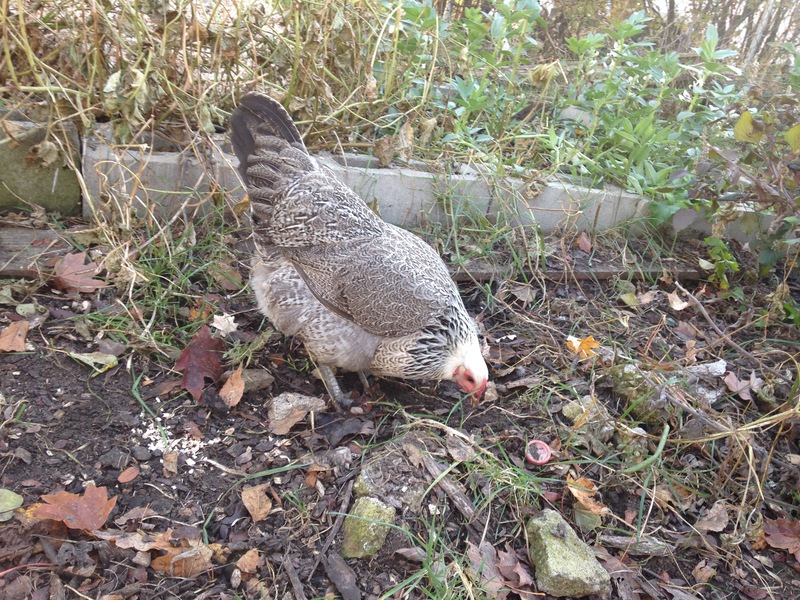 Earlier in the week they discovered the sunchokes. 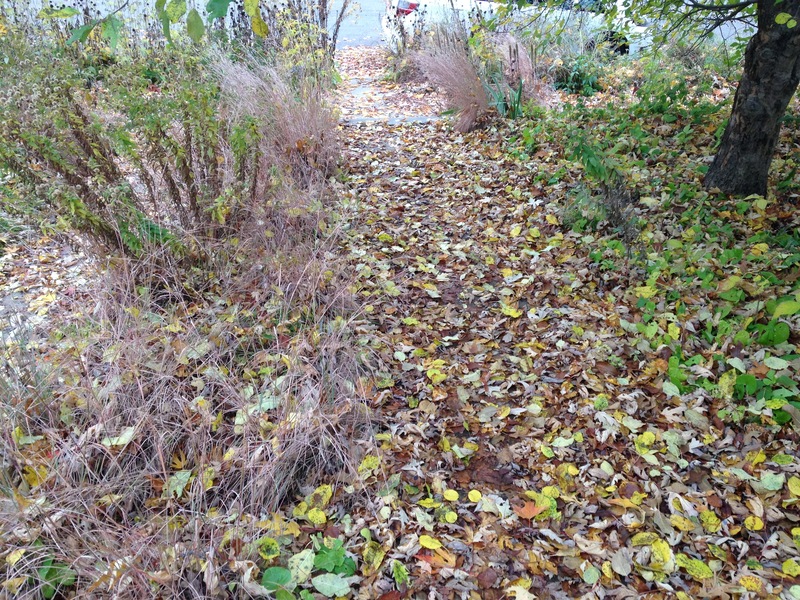 Some of them had spread out into a garden path and they had been scratching and digging around them. One of them uncovered a root and they quickly discovered that sunchokes are tasty. So they kept digging and found more. Thus far they have only been digging for them in the path and haven’t actually gone into the bed to dig. I dug some up myself and Bookman is going to boil them up and mash them like potatoes as part of dinner tonight. This will be the first time we have had them. The patch was big enough to harvest from last year but the ground froze faster than expected and I didn’t get a chance to dig any up. This year is a different story, I just had to get my share before the Dashwoods got them! Last night Bookman and I watched Leonardo DiCaprio’s climate change documentary, Before the Flood. It was very good and is free to stream online at National Geographic and on YouTube. For a critique of the film from Rob Hoskins, someone who is part of the transition movement and has been working on climate change issues for a long time, see his blog post about it. As for me, I have many thoughts about the film and DiCaprio, and Bookman and I had some discussion about each of our perspectives. I personally didn’t learn anything new from the film but what it did do for me was give me visuals of things I had only ever read about. The visuals made it all so much worse and I had to stifle a sob a few times during the film. When it was over I felt devastated. I still do. Now anger and grief and cynicism are bubbling up and fighting it out with optimism and hope. The scary thing is, I don’t know who is going to win. Before the Flood is an hour and a half long. Watch it as soon as you get the chance. And afterwards, if you need someone to talk to about it, feel free to click my email link over there on the sidebar. Cycling this week was lots of hard work. Tuesday I had a virtual group ride with some other female cyclists up Zwift Mountain. Wednesday I did a time trial race again and came it sixth out of seven. The race is on a mostly flat course and the fifth place guy beat me by one second but his average power was less than mine. I asked a coach I know on Zwift about how this works and what I was doing wrong and she said on a flat course my weight, which is significantly less than the men, is a disadvantage. On a flat course it is all about who can put out the most raw power, not about power per kilogram. In other words, my 170 watts — equal to 3 w/kg for me — is pretty much always going to get beat by the guy putting out 200 watts even if that equals only 2.7 w/kg for him. Unless we race by weight class, the coach told me, it will never be a very fair matchup. Oh well. Good thing my ego and self esteem aren’t dependent on winning any of these races. I pretty much see them as pacing practice and a workout with extra motivation. And at least I didn’t come in last! 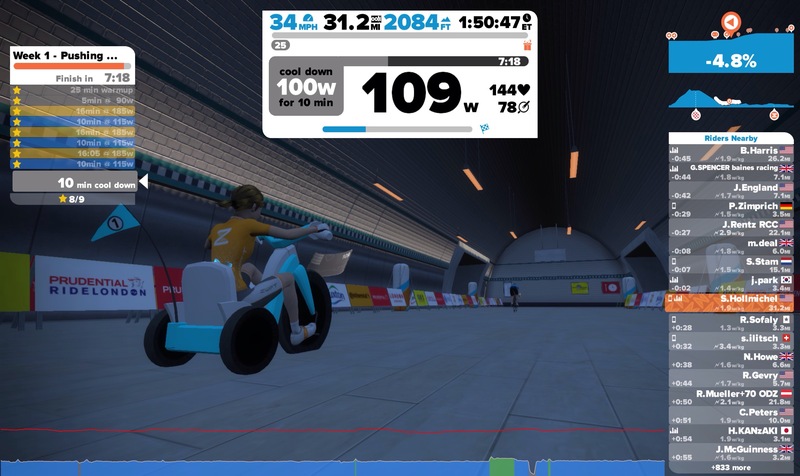 Speaking of workout, I had a super hard two-hour workout Saturday that I combined with a contest Zwift is currently having. Ride 100 km/ 62 miles and be entered to win a trip to Long Beach California in December to help Zwift distribute big wheels to kids. As part of the fun of the challenge, my avatar got to ride her own “z-wheel.” After my horrendously hard workout I had to ride another 30 miles but at least I got to do it at an easy pace. Thank you for the reminder about Before the Flood. I need to watch that. We broke a temp record this week I think we got up to 91 on Wednesday. Crazy. Hope you have a great week ahead, Stefanie! Iliana, that’s crazy hot for this time of year! And thanks, I ope you have a good week too! There have been the first falls of snow in the Highlands and it’s a lot colder than it was last week so winter is on its way to Scotland, but it has been very mild until now. I have never even heard of sunchokes! Katrina, I’m afraid we will get a rather fast transition like yours when the cold finally arrives. 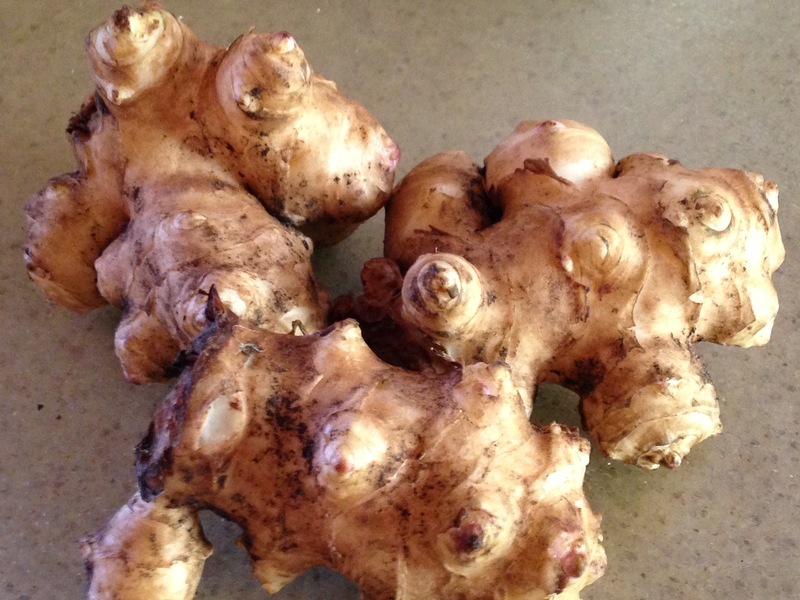 You might know sunchokes as Jerusalem artichokes. They are a native prairie plant and are a species of perennial sunflower. I’ll try to watch Before the Flood. Maybe when my dread is over, After the Election. Jeanne, yeah if you have reached your dread threshhold, better to wait a little while. Just a quick comment. I heard on the news this am that scientists are suggesting that Australia’s record hot year in 2015, is likely to become the new average within 10 years, and that this is happening sooner in Australia than the northern hemisphere. And still our government buries its head in the sand. I missed Before the flood when it was here, but need to check it out. whisperinggums, oh dear, that’s not good at all. Climate scientists are getting all sorts of surprises their model didn’t account for as the global temperature rises. As if it wasn’t scary enough, scientists only think they know what will happen so things could end up being a lot worse than anticipated. What a cheerful thought! No, it’s pretty scary all round. I love that countries like Spain, are taking it really seriously and have moved into alternative energy in a big way. I’m not sure what else they are doing but it’s a good start. As for not being entirely ego-free, I hear you sister! I think that’s the sort of ego I have too. There are quite a few smaller countries that have taken steps into alternative energy. Sweden has declared that it will be the first carbon neutral country on the planet and is moving fast toward the goal. It’s heartening. Actually my own city, territory (were a bit like DC though we do have a fair bit of “landscape” as well as urban areas) plans to be using 100% renewable energy by 2020, some provided by us and some bought in from neighbouring states. I believe we are pretty much on target. That is great to hear! Minnesota is working towards it but it is going very slow. Minneapolis as a city is doing it’s best to get there but there are limitations because of the state. I wish it was going faster but at least we are moving in the right direction and that’s something. I think we call sun chokes ‘jerusalem artichokes’ over this side of the pond. Yummy yummy, lucky Dashwoods. Thanks for the pointer on the DiCaprio film. I had heard about it but essentially dismissed it as ‘not for me’ since I’m pretty well informed, not be mention depressed, about the issue already. But if you think it’s worth watching, I’ll give it a shot. Did you read the Naomi Klein book, ‘This changes everything’? I hear it’s very good but, again, I don’t need convincing and I don’t see the point in making myself sad. Super impressed by your fitness regime. I wish I had one! The film is good and worthwhile even if you are already informed. There are some gobsmacking moments in it like when Leonardo tells the Indian ambassador that the US is not going to change its lifestyle. I have read Klein’s book. It is really excellent. She does a great job at following the money. Thanks! My current fitness regime is years in the making, starting from nothing. Never too late to start one of your own! I love the taste of sunchokes but I have difficulty digesting them. If you have a way, I’d be happy to try again. I was aware of the movie but I too am easily depressed by that sort of visual information and I am already too sensitive on this topic. There was an interesting EDX MOOC on Climate change denial, and it was so interesting, but it highlighted how difficult it is for people to change their mind about a topic. So when it comes to the movie, I’m afraid only people who are already convinced will watch it. Sigh. smithereens, the internet tells me that some people have difficulty with sunchokes. It has to do with the kind of carbohydrate that is in them. They should not be eaten raw. If they give you troubles, you could always try small quantities to see how much you can tolerate. The movie is rather depressing though it tries not to be. There was one scientist in it who gave me a bit of hope. He said that if we can significantly lower our emissions, it would still get warmer for a little while but then it would peak and begin to cool off again. Since the movie is free, I am hoping teachers start having their students watch it and then the kids start pestering the parents. It is, after all, their future we have messed up. This weather is downright scary when you stop to think about it. November 7th without a freeze? Unheard of. It still amazes me that people out there question the existence of climate change. We are experiencing it right now, and while it is glorious on one hand, the implications are too frightening to ignore. Michelle, the weather has been so beautiful but it is hard to truly enjoy it because it isn’t supposed to be this way. It is hard to believe there are so many people who think climate change is a hoax. We just dropped down into the low 80’s last week. Things that should be gone are blooming their hearts out, some for the second time. I’m not sure I’d watch Before the Flood–I’m in need of more positive and hopeful books and films right now. Changing a lifestyle is difficult, and there is always the tendency to wait until something drastic forces the change. And something drastic seems imminent now. Jenclair, wow, that’s crazy! Changing a lifestyle is difficult but we’ve used up all our waiting time and we have to do it now or things are going to get a whole lot worse. I’m not sure I have ever heard of sunchokes before and have never seen one–and you mash them? What do they taste like? I thought it was ginger when I first looked at the picture! It was a beautiful weekend here, too. I can’t believe it is November either, though it is rainy and grey today. So that always helps put you in a fall mood. I am not sure I can handle watching the climate change video (after my weather comment just above…..)–I am not sure how depressing this week is going to turn out and I can only handle one disaster at a time…..
Danielle, you can boil and mash them or make chips out of them or roast them, bake them, pickle them, puree them into a soup. Sunchokes are tubers like potatoes so you can use them in similar ways. They have a sort of nutty flavor, kind of sweet. Some say it is like a mild artichoke flavor which is why they are also called Jerusalem artichoke but I’ve only had artichokes once a long time ago and I don’t remember what they taste like. Fingers crossed the election results won’t be depressing!